This article is from the Holiday 1997 AFRMA Rat & Mouse Tales news-magazine. QI found your address in a book titled MICE: A Complete Pet Owners Manual, written by Horst Bielfeld. Reading this book was very helpful to me, but it also left me a lot of unanswered questions. Hopefully, with your help I can get a lot of those questions answered. Is it true that a rat will chew its way out of anything that is not glass? Do I have to house mine in an aquarium? Also, what will happen to a rat if it does not gnaw its front teeth down? What should I give my rat to chew on? ARats are very efficient chewers. It is probably true that many rats would chew their way out of containers not made of glass, hard plastic, or metal. Glass aquariums are not the only way to house rats. Many aquariums are now made out of Plexiglas or plastic, and these make very suitable rat homes. Their sides are smooth, so rats can find no place to get their teeth around and chew. Large metal cages also work well. Ideally, cages should contain several levels and have a solid floor. Wire floors often cause the rats to break their legs and feet, particularly if they are made of ½″ x 1″ wire mesh. The best cages have either a plastic or metal pan as their base and shelves made of solid metal or ½″ x ½″ mesh. I have never heard of a rat chewing its way out of any of these, but I won’t say it’s impossible. Before these types of cages and aquariums were easily available, many people built their own cages out of wood and either wire mesh or glass. Unfortunately, wood is easily chewed, and many rats were eventually able to escape. Also, wood cages are impossible to disinfect. If a rat’s teeth grow normally, they will get worn down when the rat eats and when it grinds its teeth together. This is one reason why lab blocks and other hard foods are ideal for rats. No other gnawing is necessary, though rats enjoy it. Pieces of wood, cardboard boxes, and toilet paper tubes are all relished by rats for chewing on. Some rats have teeth which are malocclued and do not grow normally. These teeth do not meet at the tips and often grow off at an angle. If malocclued teeth are not trimmed, they will get so long that the rat cannot eat properly. They also may grow so long that they puncture the roof of the rat’s mouth. If your rat’s teeth do not appear to grow normally, it is a good idea to see your veterinarian for advice. They can trim your rat’s teeth for you or show you how to do it yourself. QI recently checked out a book about mice from the library in order to write a report. I am writing a 4-H manual for Marion County 4-H in Indiana. I show Guinea Pigs (Cavies) in the A.C.B.A. (American Cavy Breeder’s Association). We show and judge them on body type and different colors and varieties. Is this also how you show mice and rats? How do you judge your animals, and do you have standards for them? 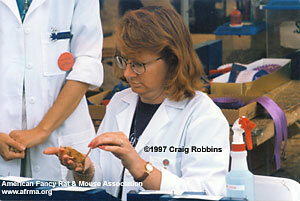 AYes, the procedure we use for rat and mouse showing is very similar to that used by the rabbit and cavy clubs. First we start with a written standard. This is a written description of exactly what each type of rat or mouse should look like. The standard begins with a general description of what the body of the rat or mouse should look like. This includes descriptions of the head, eyes, ears, and tail, and has a section on type, temperament, and condition. This accounts for half of what the rats and mice are judged on. The standard is next broken down by the coat varieties. In rats there are 5 (Standard, Rex, Tailless, Hairless, and Satin), and in mice there are 7 (Standard, Satin, Long Hair, Long Hair Satin, Frizzie, Frizzie Satin, and Hairless). The standard describes each of these, and the sections that are shown under them. Each section includes a number of different colors. The standard gives a detailed description of each, including faults to look for and disqualifications. The coat and color make up the other half of what is judged. Naturally this standard is an ideal. It describes what breeders are trying to reach when they breed their rats and mice. The closer the animals come to meeting the standard, the better they will do at the shows. It is considered impossible for an animal to precisely match the standard, but breeders strive to get as close as they can. When a judge evaluates an animal, they are comparing it to their interpretation of what the standard is describing. Each judge will have a slightly different interpretation of what this “ideal” rat or mouse should look like. AFRMA’s show procedure is very simple. The animals are each called up to the table by their Variety and Section (i.e. all Standard Self mice are called up first). Each section is judged, and the winner stays on the table. When winners have been picked from each of the Sections, the judge compares them and the one that fits the standard the most closely, wins Best of Variety (best of that coat type). When all of the Best of Variety winners have been chosen, they compete for Best In Show.